It may already be December - the month of peppermint, gingerbread, and eggnog - but in our house, it's still pumpkin season. Of course, that's mostly because I finally got around to cooking the bigger of our two pumpkins this past weekend. I know, I know, I'm a little behind the times, but considering the fate of last year's pumpkin (a.k.a The Pumpkin of Shame), I think I'm doing pretty well. Although I'm not averse to using canned pumpkin, I love to make my own puree and I pick out a couple of pumpkins for that purpose every year. This year, one large pumpkin and one pie pumpkin (the flesh of the smaller, 'pie' or 'sugar' pumpkins is usually sweeter) were chosen to make the transformation from pumpkin to puree. Unfortunately, the cleaning, cooking, and pureeing process can be laborious and messy (all those stringy insides and slippery seeds - and then you have to wait hours for the rinds to cook in the oven!) so I usually try to have a bit of fun with our pumpkins first. Since traditional carving makes the inner flesh unusable, I usually stick to relief carving - and cut into the pumpkins only a few days before I intend to cook them. All cheesy puns aside, this large pumpkin gave me a couple pounds of puree - much more than I could fit in our freezer, so I had to act quickly. 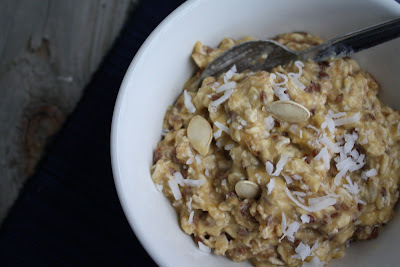 I took a half cup of freshly cooled puree, mixed it with some vanilla soy milk and oatmeal, and created these overnight oats. They make a hearty breakfast, and with the hint of sweet from the soy milk, they're almost dessert-like. 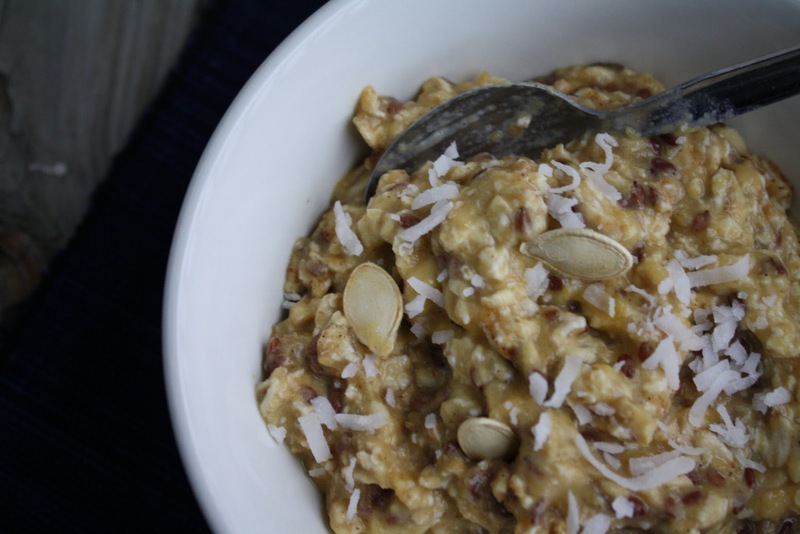 In a small bowl, stir oats, milk, and pumpkin puree until well blended. Stir in any desired add-ins (you're by no mess limited to the choices listed here - the options are limitless!). Cover and place in refrigerator for at least one hour or overnight. Before serving, top with coconut, raisins or nuts. 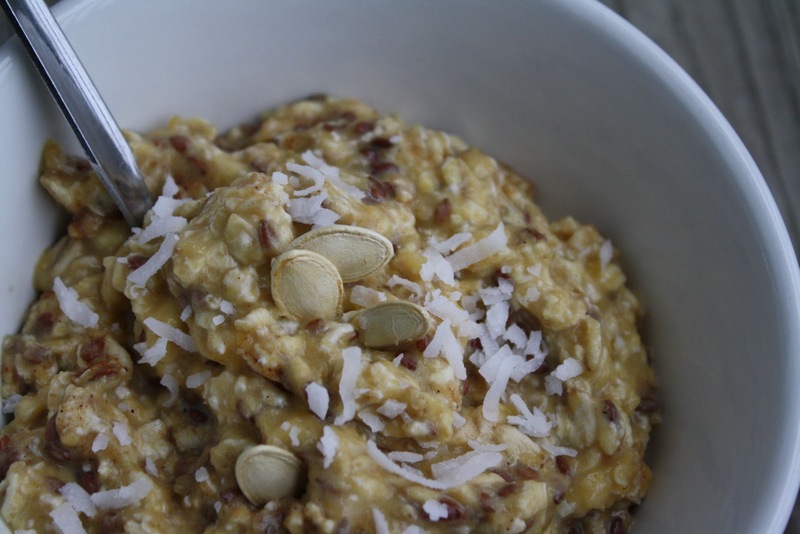 Enjoy your velvety smooth oatmeal breakfast cold! A few notes: I've seen similar dishes all over the blogosphere, but this is my first time trying overnight oats and I have to say, I'm hooked! I loved the pumpkin variety and had some fun playing with mix-ins - deciding on cinnamon, a sprinkling of coconut, some flax seeds, and freshly toasted pumpkin seeds. Because I used vanilla soy milk, I didn't feel the need to add any sweetener, but you may want to add some brown sugar or maple syrup if your milk is unflavored or unsweetened. 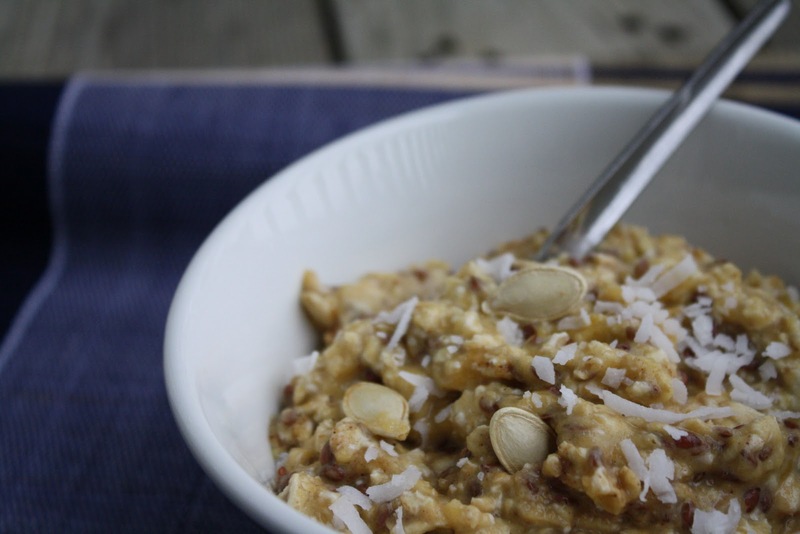 This oatmeal looks and sounds amazing! I love anything "pumpkin!" PS. Thanks for popping by my FB page today. I am a new FB liker and GFC follower and am looking forward to reading more! What a great smell to wake up to and a very hearty breakfast. I love your recipe! Thank you so much for sharing with Full Plate Thursday. Hope you are having a great week end and come back soon! Thanks so much for linking up to Crazy Cute! 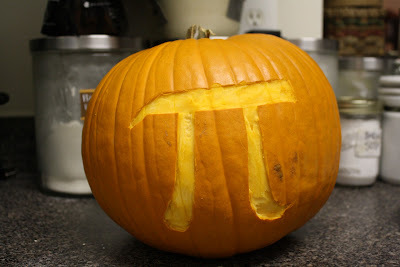 This looks absolutely delicious and I love your Pumpkin Pi! LOL! Families really value their pets. They become more than pets in most cases. cat carrier are just like members of the family.